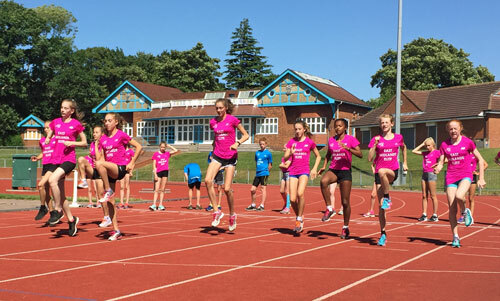 Leicestershire Running and Athletics Network collaborate with member club coaches to host the first in a series of workshops aimed at raising standards of the younger age groups as well as providing an opportunity for practical coach education. John Skevington coach and coordinator of the Leicestershire Running and Athletics Network teamed up with Rob Griffiths, lead coach at Network member club Saffron AC, to invite the best East Midlands under 13 and under 15 middle-distance runners (selected by strict time criteria at 800/1500) to experience a squad day where they could mix with their fellow “elite” from across the region. 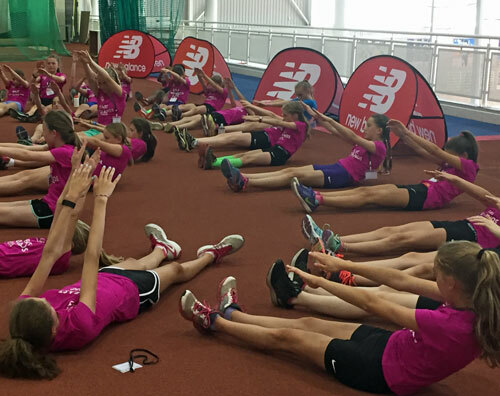 The day opened with the distribution of the specially printed “East Midlands Elite” T-shirts which had been provided by the event sponsor New Balance and was followed with a track session where the 58 young athletes were split into ability groups. Then a timely talk by physiotherapist Brian borrows which was followed by a most interesting Q&A slot with two-time Olympian Nick McCormick and European and world junior athlete Amy Griffiths. A brief talk by Penny Briscoe ,Team GB Chef de Mission for Paralympic sport, opened the post-lunch programme and the afternoon session was kicked off with an insight into the importance of good biomechanics and core stability, from former international athlete Tim King, before moving on to a practical drills session which was led by coaches and club athletes with critique input from the observing coaches. 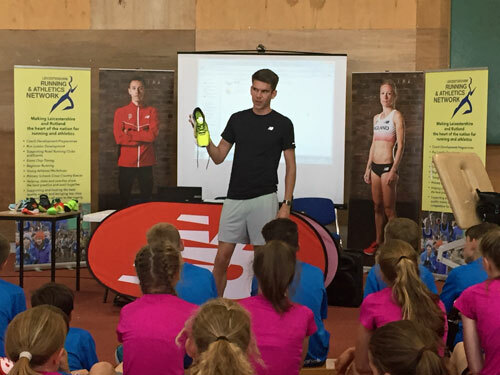 The day was wrapped up with a really interesting talk by New Balance about their shoe range and was concluded with a “heads and tails” game where one very lucky young athlete won a pair of New Balance running shoes! An important part of the day was the coach education element and 12 coaches from across the region accepted the invitation to, not only observe the day’s proceedings, but also to take part and hone their coaching skills during the afternoon drill sessions. Feedback from everyone attending was that they found the day of great interest and felt they had been exposed to new ideas and initiatives which they would be incorporating into coaching regimes back at their clubs. No sun, but lots of fun! The need for sun cream was far from everybody’s mind during the third Leicestershire Running and Athletics Network summer running camp held at New College; however, the unseasonal weather didn’t stop the two days of running, running games, running drills and a great deal of fun being a huge success. 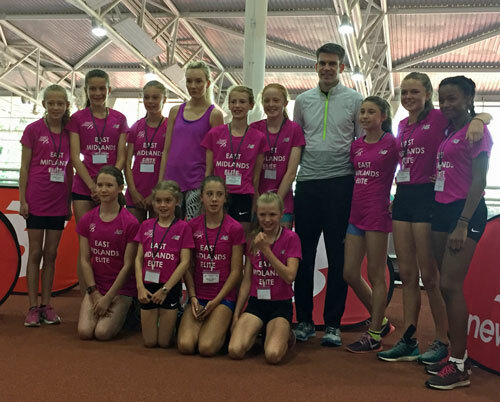 The group of 35 runners ranging from age 8 to 13 were admirably looked after by network coach John Skevington and assisted on day one by Will Goodbourn; a young up-and-coming coach being supported by the network through his qualifications to become a fully licensed coach. Will took the lead throughout the second day, under John’s supervision, and everyone declared him a great success. 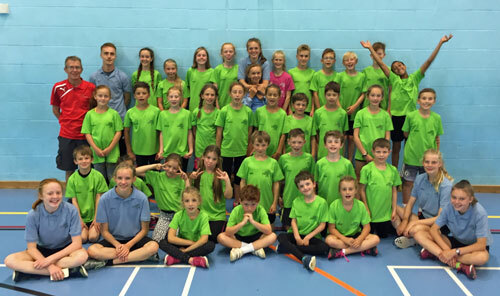 The days were also ably supported by a variety of athletes who had attended in previous years and enjoyed it so much that they wanted to continue their involvement in the event. Everyone looked resplendent in the branded T-shirt individually printed with their name; something that made each of the young athletes feel especially important! Highlights of the two days were definitely John Skevington’s famous games “Spring the pack”, “the 1-5 game” and “rats and rabbits” which were repeatedly requested throughout both days! 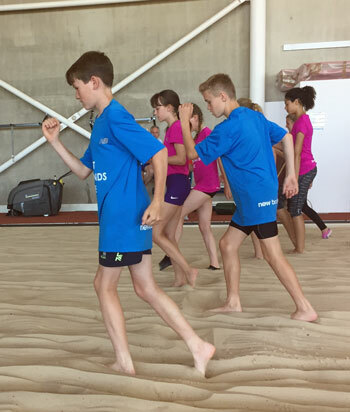 The summer camp has now become a firm fixture in the network calendar as part of its programme to develop young athletes in a fun atmosphere and will be on doubt be back again next year, hopefully in more seasonal weather!